May the Wings of the Butterfly ……. Everyone has something that they go dilly over and those who know me well know that yes I go dilly over anything to do with cupcakes but my real love is for butterflies. 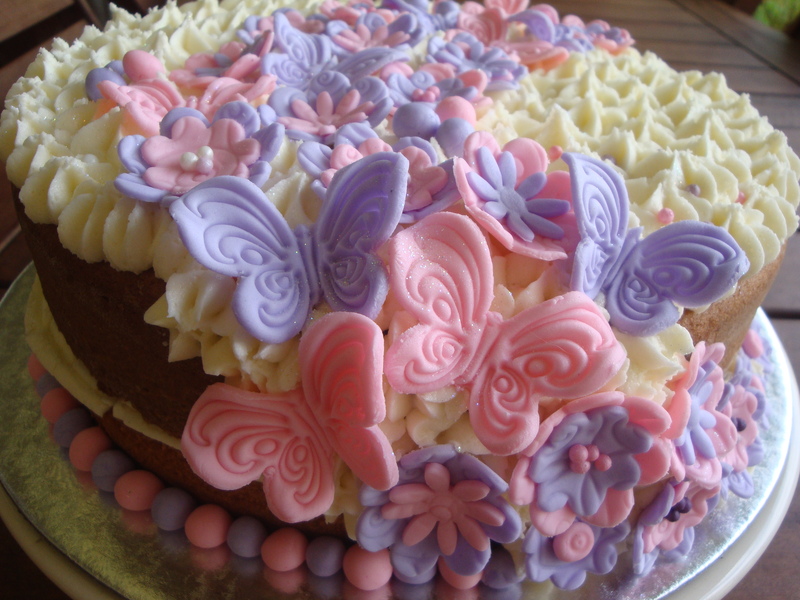 I have now made countless butterfly cupcakes in every colour and on Sunday I was delighted to be able to make my first butterfly cake. This cake was ordered by Jean, a very excited granny, for her granddaughter’s birthday party. Ashleigh was turning 6 and she wanted butterflies and flowers on her cake and cupcakes and they had to be pink and lavender. 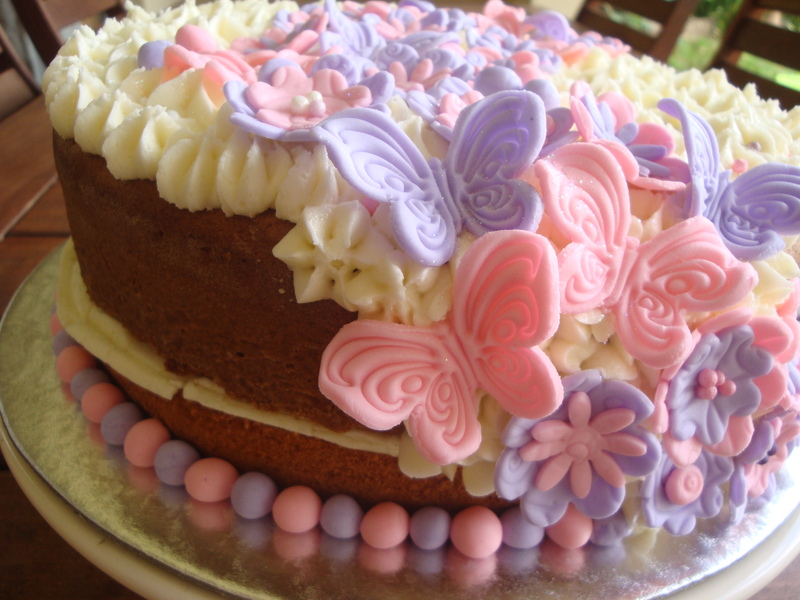 I had a picture in my head of flowers and butterflies cascading gently over the top of the cake and down the side. It was brilliant when I saw the cake translate from the image in my head to this really pretty pastel birthday cake. I finished off the edge of the cake with pastel pink and lavender sugar paste balls, an idea that is seen in so many baking magazines now but one I hadn’t tried out before. Hats off to the sugar art crafter who started this trend as it completes a cake beautifully and just gives the cake a more contemporary feel as opposed to the piped icing edging I had been using to complete my cakes. I have started embossing the flowers and layering the colours as this adds texture and interest to the sugar art flowers. It doesn’t get any easier than finishing off the centre of the flowers with a small ball of sugar paste in a contrasting colour or a few sugared pearls. This is now of course a great excuse for me to collect bottles of these different coloured pearls – I have a weakness for collecting beautifully coloured articles from paper to flowers to butterflies and sugared pearls. What a delight to have such amazing colour choices in our lives! ← Dora The Explorer Cupcakes! Lisa, there are so many beautiful examples of your work, but this one still speaks to the little girl in me! Thank you Hester for such a beautiful comment!